You can now realise the true potential of digital audio formats into your system. It's not just limited to digital content with the inclusion of an analogue audio input, such is the versatility of this product. Nothing comes between you and the music you love. 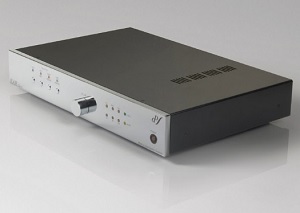 The EAR DAC 4 can handle all the popular formats up to 192 KHz 24 bit audio, enabling you to play high resolution formats. This DAC will open up your digital world. Building upon EAR Yoshino's success of the EAR DACute and Acute 3, Tim de Paravicini redesigned the output stage from the ground up. It now comprises of four PCC88 valves and circuitry to match. Integrating the valves, the circuitry, the transformers and digital chips to all work together creates the best possible experience. Leaving you with sensational audio. Everything you do with the EAR DAC 4 stems from its core. When you have a great digital engine, the whole experience becomes better. That's why the DAC 4's digital decoder now utilises two Wolfson WM8741 DACs, each configured in bridged mono. Each individual channel is connected to its own analogue output and transformer, negating the need for any detrimental solid state signal conversion and buffering. When you can't hear the digital processing, you hear the whole sound, or note, or song, in ways you've never experienced before.